I absolutely love this app at the moment; it takes literally a few seconds before you’re presented with a variety of video options. This is a great way to catch alternative live and acoustic versions of the songs you love. Music TV - Streamer & Video Player (for YouTube)! 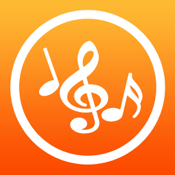 The premise of this app is simple; import your Music Library and gain access to the corresponding music videos along with a selection of alternative videos depending on whether you want to watch a live version or a video with lyrics. For the majority of songs, you can actually access the lyrics from within the app, although I’ve noticed that some songs only show the first couple of verses of lyrics, apparently due to licensing issues. If you don’t want to watch the video, you can still listen to the audio in the background as Music TV supports multitasking. Another thing I really like about this app is how you can tap the Cache button and save videos for offline viewing; this is great if you’re putting together a playlist and would like to include some more obscure versions of songs. You can also port your music video via AirPlay to your Apple TV; so again, the caching feature is great if you want to arrange a line-up of videos to watch on a bigger screen. The developer also states that Music TV features a “self-learning algorithm” which means the service will become faster and more accurate with time as the user base grows. Music TV has definitely earned a permanent spot on my iPhone because it saves so much time and hassle having to search YouTube; the video selections have all been spot on for me so far and I’ve managed to uncover some awesome live versions of songs by some of my favorite bands. This app also lets you share your playlists on Facebook and Twitter, so as you can probably imagine, I’ve been bombarding my friends and family with loads of music suggestions mainly because Music TV makes the process so quick and easy! If you love music and enjoy watching music videos, you’ll definitely want to check this app out; I really don’t think you’ll be disappointed.